When Yale was established in 1701, its founders took for granted that it was an institution by and for men. 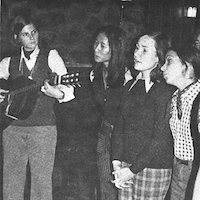 It remained so for a very long time, but women had begun to make an impact well before co-education finally came to Yale College in 1969. The School of Music, which was established in 1894, admitted women from its inception; by the early 20th century, they made up about half of its students. The Music Library's latest exhibit (Feb 25th - Apr 30th 2019), Musical Daughters of Eli: Women Pioneers at Yale, highlights just a few of the many women who have blazed trails in music at Yale. Some of them made music as performers or composers, while others were active behind the scenes, building institutions as administrators or philanthropists. These women were not always welcomed, but they persisted, and they accomplished great things. The exhibit will feature a variety of materials, such as music manuscripts by two early composers (including one of the first African-American students at the School of Music), a book based on the dissertation of one of the first women to earn the Ph.D. in music history at Yale, concert programs by the Yale Glee Club during its transition to co-education, and a Yale Daily News article about a performance by New Blue (pictured here in 1973), Yale’s first female a cappella group. At the Music Library, we take special pride in our first head librarian, Eva Judd O’Meara, as well as Vivian Perlis, a music librarian who founded Oral History of American Music. An online version of this exhibition is also available.